Leg 5 leader of the Volvo Ocean Race, Groupama, skippered by Franck Cammas, has throttled back to preserve man and boat as the fleet felt a return to the classic Southern Ocean conditions of huge, confused seas and gale-force winds on Tuesday local time. Despite a lead of just 37 nautical miles, Cammas and crew chose safety over speed to avoid breakages to their Volvo Open 70, as winds hit more than 35 knots and waves grew to around six metres, following a brief respite from the thrashing yesterday. Four of the six yachts have suffered damage so far in the 6,700nm leg from Auckland to Itajaí in Brazil, and Groupama’s skipper said in the Southern Ocean, survival must come before speed. Groupama helmsman, Laurent Pagès, added: “We have been sailing this way since we got to this part of the ocean where the sea state is really bad. Despite slowing the boat down, Groupama was hurtling along at an average of 21 knots in the three hours prior to the 1300 UTC position report. Hot on her heels was Ken Read’s Puma. Both teams have passed the eastern ice limit, allowing them to dive south and take the shortest possible route to Cape Horn, around 1,200nm away. Telefónica slipped to 314nm off the lead after being forced to hold back to prevent damage to the bow getting worse. Still in fourth, but heading to southern Chile to carry out repairs to their damaged bow, Camper with Emirates Team New Zealand’s crew celebrated getting to within 2,000 miles of their destination, Puerto Montt. "It’s a milestone for us; another step towards getting to land and making the repairs,” helmsman Tony Rae commented. "Once we get to Puerto Montt and have a look at the damage, we’ll know when we can leave again." At 1415nm behind the leader, Abu Dhabi Ocean Racing was revelling in much less dangerous conditions than the rest of the fleet, her crew looking forward to opportunities further along the course. "We haven’t seen too much harsh weather since leaving New Zealand so we’re just chipping away and enjoying the downwind Southern Ocean downwind yachting,” Abu Dhabi’s newest recruit, Australian triple Olympic sailor, Anthony ‘Nocka’ Nossiter, said. Nocka, who last competed in the Volvo Ocean Race on the Race’s now CEO, Knut Frostad’s Djuice Dragons in 2001-02, added: “We’re quite a long way off the pace with our delayed start time, but you never know what can happen. 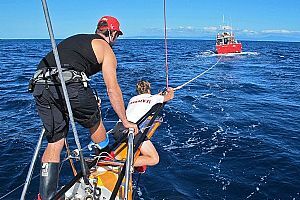 Mike Sanderson’s Team Sanya reached Tauranga in New Zealand on Tuesday, five days after a broken rudder forced them to turn back. Sanya will be shipped to Savannah in the United States for repairs before sailing it to Miami to re-join the race for Leg 7.